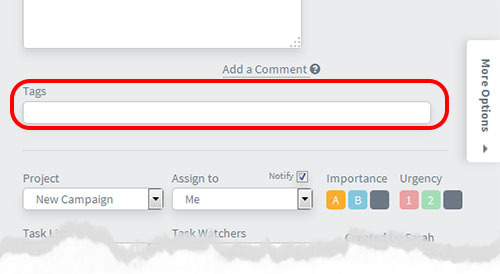 Tags are “reference words” that you can add to tasks. They are like keywords or labels that you add to a task to make it easier to find later. Tags are a helpful way to link items together and search for related themes. Rather than just being restricted to task lists within single projects, you can make tasks “multi dimensional”. For example you may have tasks in various different projects that you can complete at home. You mark each task with the tag “home”. Now when you are at home you can quickly call up all tasks marked with this home tag. Simply open a task and type a word into the Tag window. To find tasks marked by Tags click on the Tags screen link – in the left side menu link on any screen. This shows you the “tag cloud” i.e. all the tags entered. To open the list of all tasks marked with that tag simply click on the tag. will produce two tags “apple” and “ball”. Checkout this quick 90 second video on how to use Tags and how they can help you.